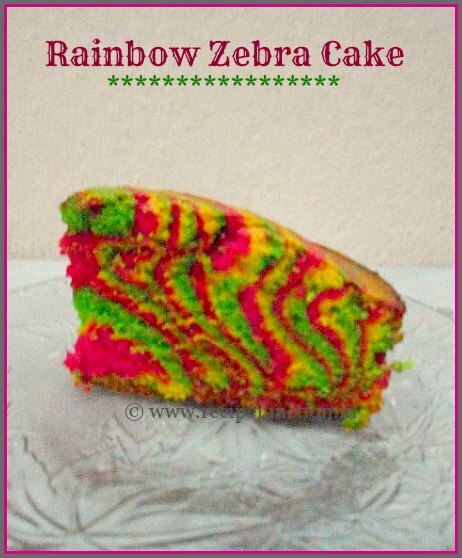 I love Zebra pattern on cake and my kids love them too. So instead of usual chocolate and white batter, I tried making the pattern with three very unusual color on one of my birthday. It was so colorful that my boys wanted to cut the cake pushing me aside. And they only cut the cake and the whole cake was gone within few hours. This is the magic of color, I think. Color always lift anyone's mood for sure. 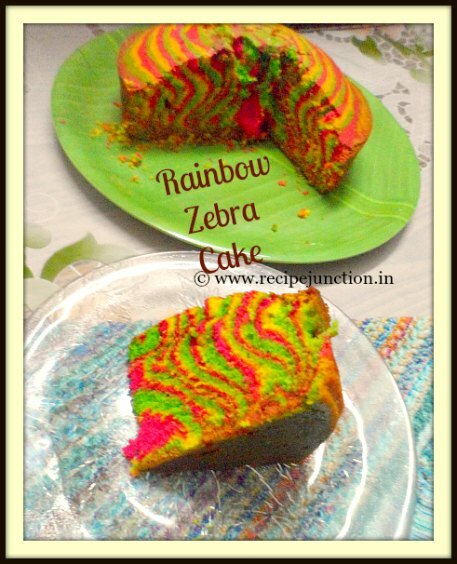 There is a simple two color -chocolate and white zebra cake on my blog. I followed the same pattern just added different set of colors, rasperry pink, lemon yellow and green. Together they made a mind-blowing color-effect and pattern. I'll recommend everyone to try this cake. This time I tried making it eggless. 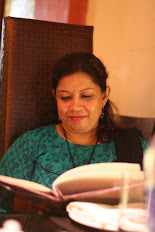 So sharing the eggless version here. Who like to add eggs, try this with egg version and follow the pattern as it is. Vanilla essence : 2 tsp. Prepare your baking pan by greasing with little butter and dust it with little flour. Dust off excess flour. Pre-heat oven to 180 degree C or 375 degree F.
To make buttermilk at home, in a bowl mix vinegar in room temperature milk and give it a stir, keep aside for 2-3 minutes. The milk will curdle. Remember to mix it thoroughly before adding it to the batter. If you get it from stores, use the same amount about 1 cup. Prepare your dry ingredients by mixing two types of flours, baking soda, baking powder and salt. Mix together very well and keep aside. This is your dry ingredients. Now in another big mixing bowl, take oil and sugar, mix a little with a blender, add vanilla essence and mix again. Now pour buttermilk and flour mixture one after another starting and ending with buttermilk. Blend well with a blender till the batter looks smooth and creamy. You can add warm milk as needed to make a smooth and creamy batter. Divide the batter in three equal portions, add three different food colors in three portions as per your choice, I added raspberry red, lemon Yellow and green. Preparing the pattern: Grease a round baking tin with butter and dust with flour allover the pan. Now take a tblsp. full of 1st batter and pour in the center. Wait a little, then pour 2nd color on top of 1st color in the center, next pour the 3rd color on top of 2nd color. This way complete the all 3 batter and your patter will be ready. Preheat your oven to 180 degree C, then put the baking pan inside on a lower rack. Bake for 45-50 minutes or a toothpick inserted comes our clean. Tip : for a crack-free and flat-top cake, wrap a wet piece of towel on the outside of the baking pan and secure with a safety pin. This does not let the cake crack from the middle. ENJOY !!!!!!!!!!!!!!! 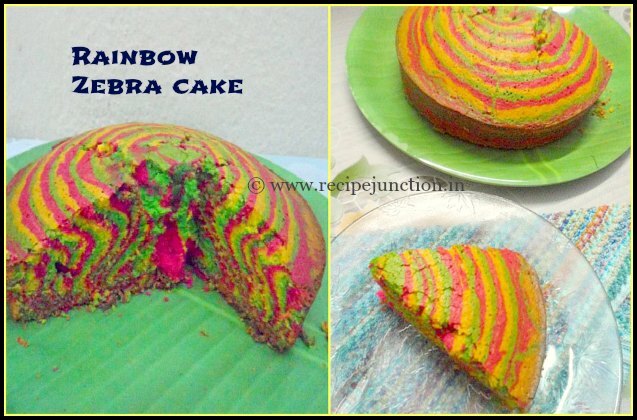 What a colorful piece of cake !!!!!!!!!!!!!! 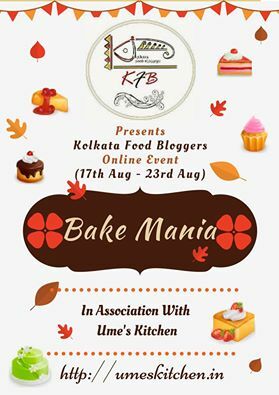 event is the brainchild of fellow KFBian Urmi who blogs at Ume's Kitchen, an awesome baker, beautiful person inside and outside. 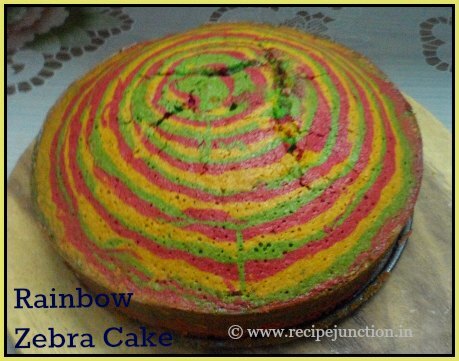 Hi Indrani, your cake looks awesome,hw ever before I make it need two clarifications,one is u mentioned that whilst mixing the vinegar with milk it will get curdled, so us one supposed to use the same. Hi Neomi,when you mix vinegar with milk, this is your buttermilk, after it curdles,just stir it and mix in the batter. If you get store-bought buttermilk, you can use that too, same amount of milk I mentioned or as needed. around 1 cup. Extra warm milk to make a smooth batter. Either you use buttermilk or yogurt, both work the same way. yes, I used a blender. Thanks, Neomi, please try out and let me know here how it has come out. All the best and thanks for visiting Recipe Junction.